Transformers Fall of Cybertron is only a month away from being released. 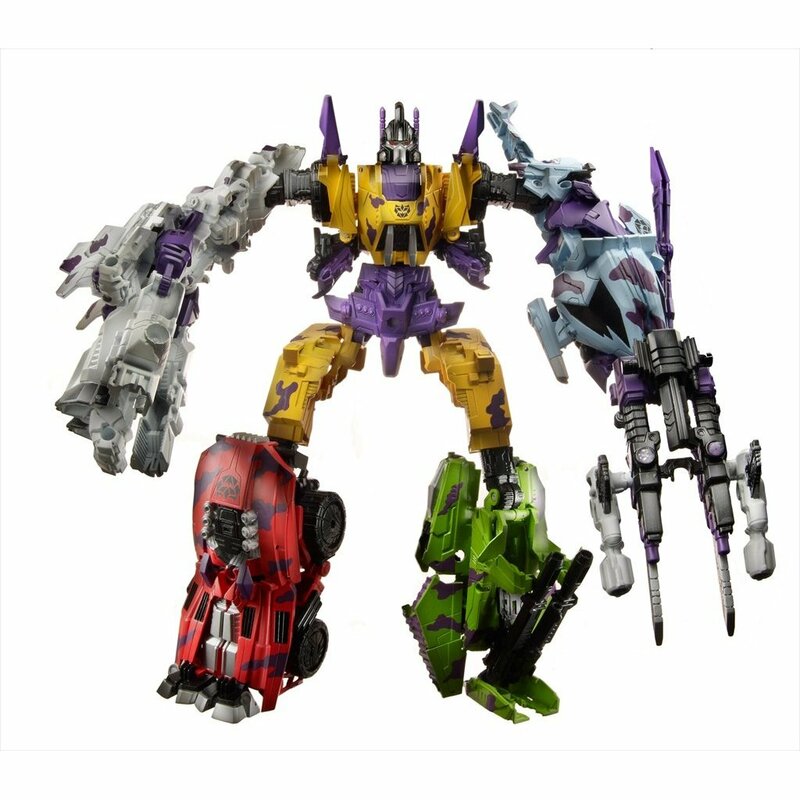 Hasbro is putting out five Transformers action figures that combine to form a larger figure called Bruticus, featured in the game. Many fans are excited about an exclusive release of the 5 figures in one set repainted in the Generation 2 scheme of the same combiner group. That set has gone up for pre-order on Amazon.com. If any of you are going to be purchasing the set, we ask you use one of the links below to help us out while you help yourself! 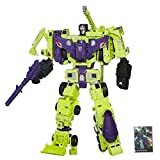 If you pre-order the game on Amazon as well, you receive a free code to allow Bruticus to use the G2 color scheme in-game. Ironhide fends off Decepticons as others evacuate in the ark, The Dinobots and Jazz take on Bruticus, and Optimus Prime is cornered by Starscream, Shockwave, and Megatron. Guess what happens next? 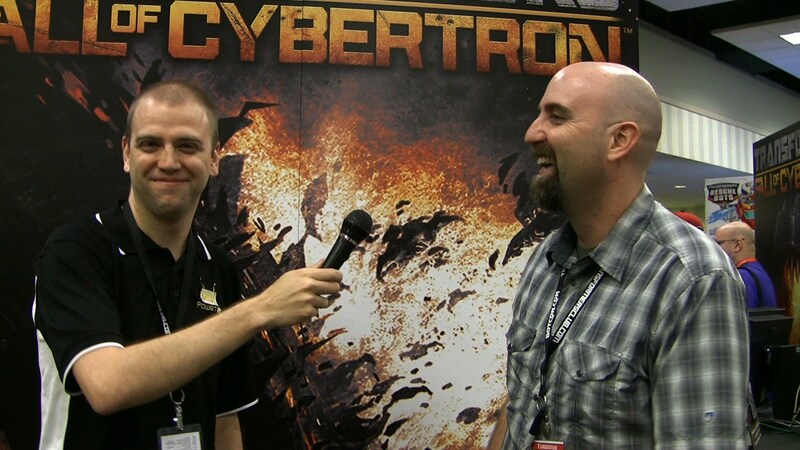 At Botcon 2012 we caught up with Matt “Tieg” Tieger” to talk about the upcoming Transformers video game “Fall of Cybertron”. If you’re not already excited for this game, you should probably check out this clip so that you can get on board. It’s a podcast for your eyes! We don’t often get a chance to do our shows in person, so when we do it’s nice to put together a little video. 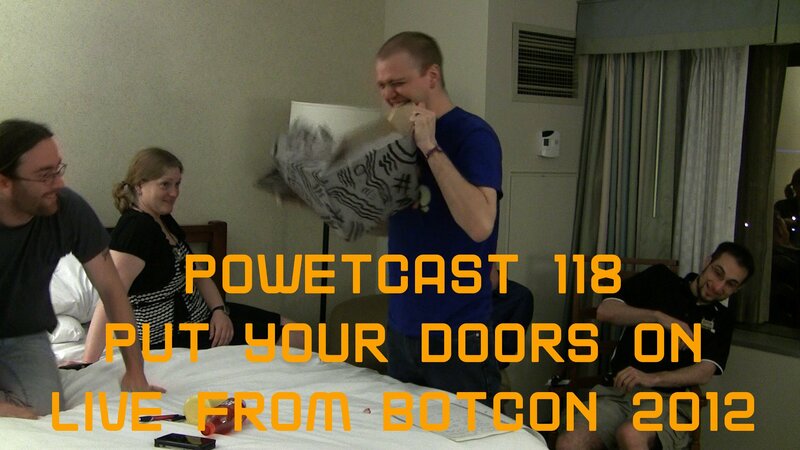 So here is the super elite behind the scenes recording of the Powetcast 118 “Put Your Doors On”, our live show from Botcon 2012. I’ve throw in some photos and clips I had handy when relevant. 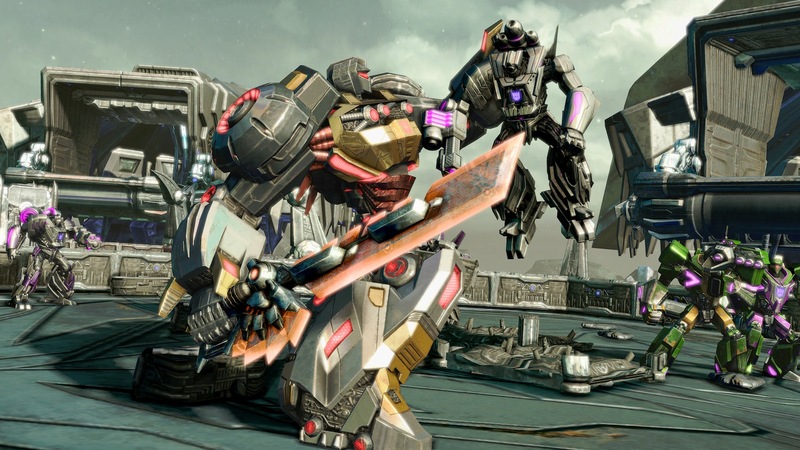 For months now we’ve been teased with the inclusion of the famed Dinobots in the next Transformers game, Fall of Cybertron. Now we really get to see Grimlock in action. 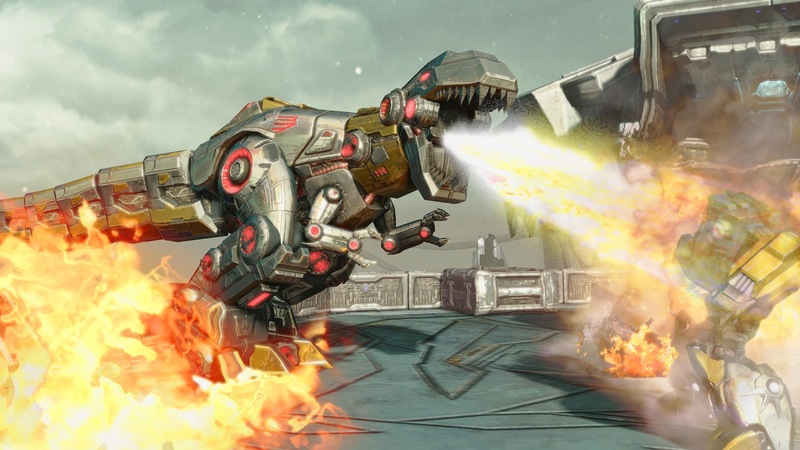 We have 4 high resolution stills of Grimlock from the game. That’s not enough? 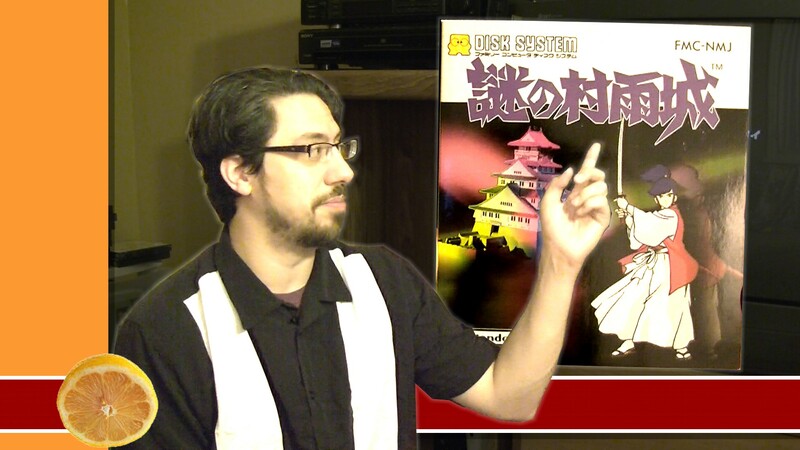 OK, here is two and a half minutes of footage with narration from High Moon Studios Matt Tieger. 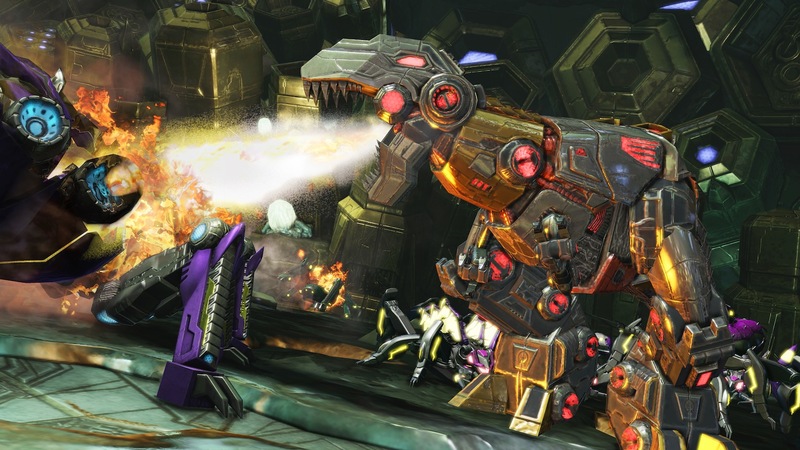 We see Grimlock performing very differently from other characters in the game. He is all close combat, using an energon shield and sword, swiping at Insecticons that threaten him 3 or 4 at a time. When he’s taken (or dished out) enough abuse, he hulks out and becomes a T Rex and has a move set that includes swping with his tail, stomping the ground and biting enemies in half. Keep an eye out for another Dinobot at the end of the video as well. Transformers: Fall of Cybertron comes out on August 28, 2012. 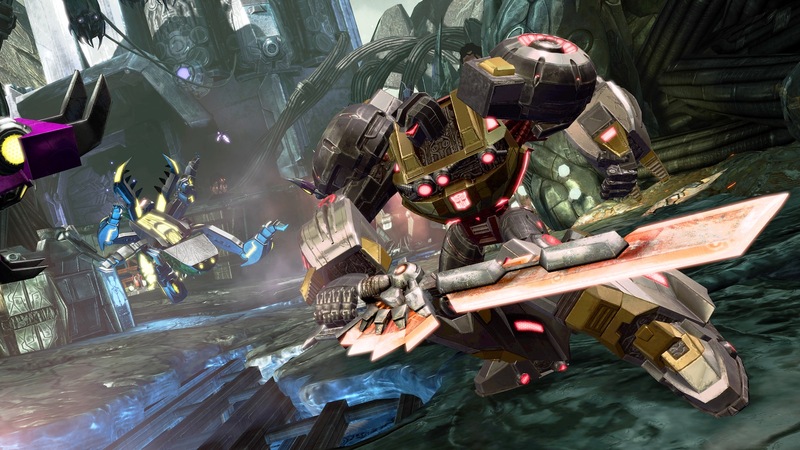 Last night, GTTV premiered the first gameplay footage from Transformers Fall Of Cybertron. It is within the full episode, so the footage isn’t available separate on the website. An interview with High Moon Studio’s Matt Tieger is from the one minute mark to the three minute mark. Tieger mentions that Optimus Prime will be able to command Metroplex during one of his levels. Also of note is that the campaign will alternate from Autobot to Decepticon and back, unlike War For Cybertron, which had separate Autobot and Decepticon campaigns played back to back. Another segment starts at around 6:15 and shows Jazz using a Bionic Commando-style grappling hook and gameplay footage with Vortex before and after combining with Bruticus.